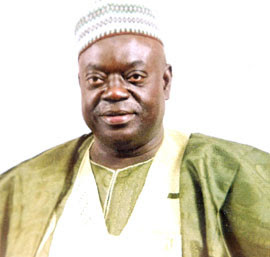 Niger State Governor,Muazu Babangida Aliyu is giving out not one but two of his daughters Dr Jamila and Dr. Hadiza Muazu Aliyu today at the family house, close to the Minna Central Mosque. This will be first time he is giving out any of his children and i hear the celebration is over the top. Security around the capital has been reinforced, all hotels fully booked and power (light) has been constant. "@Awwala: I'm nw @da venue of Niger state Govrnr's daughtrs wedding, and a helicopter is hovering above us. I pray it'll end in peace"
Mr Ahmed. 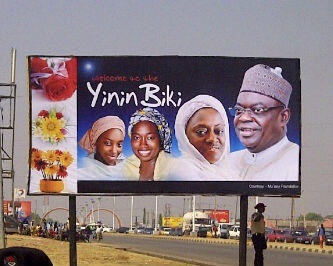 ‏@ahmedlyf Gov'r Muazu Babangida Aliyu's Daughters Wedding- #anticipatedLed tvs, Ipads, iphone5's, Bbporch, apple laptops to be shared as souveniors..
Maryam Abubakar ‏@mareeyama Look at these billboards, tomorrow if something happens to chief servant, u'll tell me to sympathise. 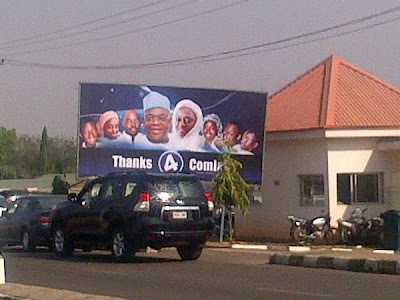 Maryam Abubakar ‏@mareeyama People are hungry, they are putting up billboards for their childrens weddings... You want me to waste my sympathy on them. Abeg, park well! Ahmad sani barde ‏@abba_sensei From road blocks to Sirens to Choppers in the air, Talba no wan make we hear word cos of d wedding. Mcj ‏@Afia_Jr The traffic in Minna ehn...*phew* all thanks to Talba's daughters wedding. Muhammad kawu ‏@muhadkolos Talba kenan...RT"@Luqman_hussayn: “@mss_phateey: There's light 24/7 in mx now... After d weddin,we'll be back to darkness” harda ruwa"
ȷè ӎ'āƤƤéƖƖé ȘƛǷΕΕϘ★ KIA RIO, PICANTO, CERATO anδ other gadgets r among souvenirs *TALBA* will be giving out to guests at DR. JAMILA & DR FARIDA's wedding today. Lamido Adamawa, Ooni Ife, The Sarkin Daura, the Emir of Ilorin and businessman Aliko Dangote. how can these people sleep with this reckless display of wealth when so many are starving? God have mercy on your soul Governor! whats all the fan fare about? cos your daughters are getting married you shut down the whole state? just proves education does not eradicate illiteracy! Gbam!